"What do 51.3 million Americans have in common? The answer is, they've listed bird watching as they favored hobby! 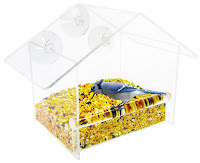 Precisely because of that, Yellow Beaks is proud to announce the arrival of Yellow Beaks Clear Window Bird Feeder that produces unobtrusive view of wild birds, right from the comfort of you own home, office, or nursing facilities." I was sent the Window Bird Feeder from Yellow Beaks to review. This bird feeder costs $25.95. Shipping is free with Amazon Prime. I'm happy to report the safe arrival of this bird feeder! I was so excited to get it, and was pretty impressed with its packaging. It was packed in a very large box, and secured very well. The box was approximately 11.0" x 7.0" x 8.25". Inside, the bird house was surrounded with Styrofoam to reduce movement during shipment. There was also an informational card set atop the actual feeder. The card provides 'Quick Tips' for installation and attracting birds to the feeder. When I took the bird feeder out, It was wrapped in bubble wrap, and then in a layer of plastic. There are three suction cups to attach to the back. I even have a suet feeder in my Japanese Maple! I was very excited to use this feeder. I took it out of the box and attached the suction cups. I hung it right on the dining window where I can see it from inside and outside. I filled it up with scratch grain for right now (I have to go get some seed). ...and I can see it from inside! You can move this to any place you wish. The best part? You can watch the birds eat from the outside! I have not found any cons of this bird feeder. Are you wanting to try the Yellow Beaks Window Bird Feeder, too? Click the link below, and order away!